Many tennis players will identify what they consider to be the problems that cause them to lose matches, but these are seldom the real reasons. They know their best strokes but they make the mistake of thinking that they never mess these up. As it often turns out, the very strengths they think they have actually cause them to make more errors than they may realize. To be fair it isn’t always easy for a tennis player to be objective and/or realistic about their game. This is why they depend upon their coaches who provide them with much needed perspective. This is great for professional tennis players who do have access to coaches, but what about the rest of us? If you play tennis at school or college, or just because you enjoy it, and you want to improve your performance, how exactly can you do that? To really know what went on during the match you will need to compile the data, so to speak. Don’t worry; it’s not as difficult as it sounds! You will need a partner to chart what occurred during the match. Basically, a statistic breakdown of the match is compiled, and with this information a player can determine what does and does not work during a match. 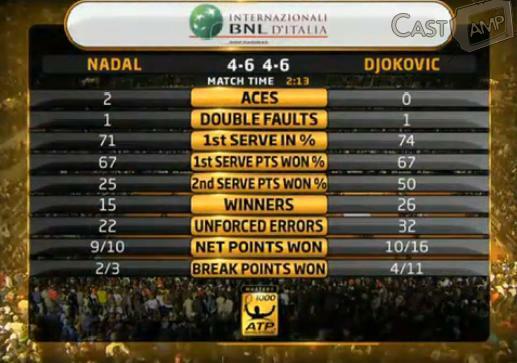 Of course, for best results you will need to record the tennis statistics for a number of matches. You will then be able to compare the results and determine where improvements are necessary as well as identify your personal trends. Why Do Tennis Players Not Chart Their Matches? To be honest it is not the easiest thing to find someone to chart for you. For those playing on a school or college team, or those playing on a league team, this problem is usually fairly easy to address. A teammate can chart your game and you can chart theirs in return. You might consider asking your spouse or family members to fill this role. In most instances they are pleased to be part of the action on the court, rather than merely watching from the sidelines. Another reason why players may not chart is because they simply do not know how to do so. The good news is that it isn’t complicated and you can make up your own tennis statistics charts fairly quickly. To make it really simple for your charting partner you can include a series of numbers for each category. A good idea is to circle the number indicate your winners and put an ‘X’ through the numbers that the opponent wins. 2. The location of the match. 3. The surface played on. If your chart is to really be beneficial in helping you to analyse your tennis game you need to make sure that every aspect is covered. The ideal situation is to have two people charting the match for you. One can chart your game while the other charts the game of your opponent. That way you will be able to compare the charts afterward and get a better understanding of what transpired during the match. It’s a good idea is to chart a player while watching a match on television. You will find that the match becomes a lot more interesting, not to mention informative when you review the results afterwards. While you may think it is not helpful, you will find that by charting your matches you will enjoy a much more interesting game. It will help you set realistic goals for yourself and provide you with greater understanding by helping you to analyse your tennis game. 1. At the top of the chart provide space for your name as well as your opponent’s name. Also, record the date, location, surface, and weather conditions. Provide a space for the number of sets played, the winner’s name, and the final score. 2. Provide space for the number of first and second serves, aces, and double faults. Also for the number of winners and errors you made in each of the strokes, i.e. : forehands, backhands, forehand volleys, backhand volleys, overheads, offensive and defensive lobs, drop shots, etc. 3. Record how many games were played in the set, how many you won and how many your opponent won, as well as any occasion when service was broken. 4. Provide a section to record the match tallies as well. This would be where your charting partner will record each number of shots you played as well as how many were winners and how many were errors. 5. Finally, the overall score of the match should be listed. You can then use these charts to review the match and determine with greater perspective, where your strengths and weaknesses lie. Create a “Remarks” section for youself or your coach to write any comments or feedback so that you can remember and improve on your next match. I have created the tennis statistics chart for you and you can use it for your tennis games. Remember, for each set, you should use one set of chart. Therefore if you played three sets, you should have three sets of completed data. I would suggest your print a few copies of clip them on a clipboard. Don’t forget to bring a pen with you. Download the Tennis Statistic Chart here. Start charting your game now. From "Tennis Statistics: Analysing your Tennis Game" To "How To Play Tennis Efficiently And Become A Better Player"